As far as slots that are based on war go, this one has found a certain niche. 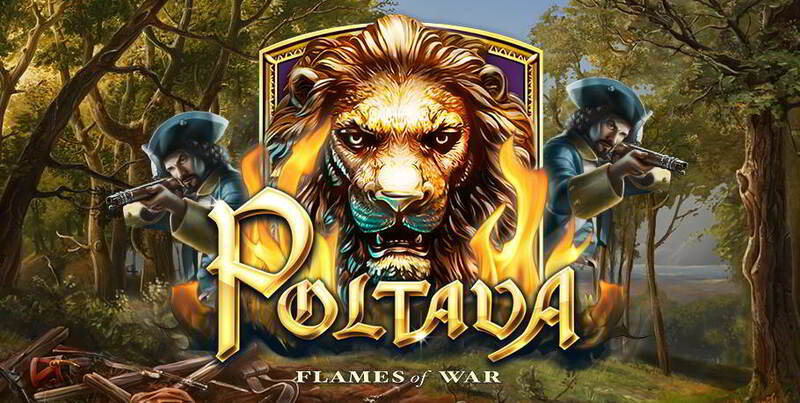 Poltava is a 5 reel historical conquest based upon the battle between the Swedes and the Russians in Ukraine. Spin the wheel and work your way through the cavalry, infantry and musketeers to earn your stripes and bounty, not forgetting some very generous free spin war bonds. Visit our homepage for tips on how to play online slots. the confidence to try something a little different with each new game. You can find out more info on slots games about ELK Studios here. Where were you in 1709? Probably not losing the battle of Poltava to Peter the Great that’s for sure. As the game’s title suggests you play in an online slot version of this famous battle with the victor getting the spoils of real-life currency! Muskets at the ready boys it’s about to get serious. 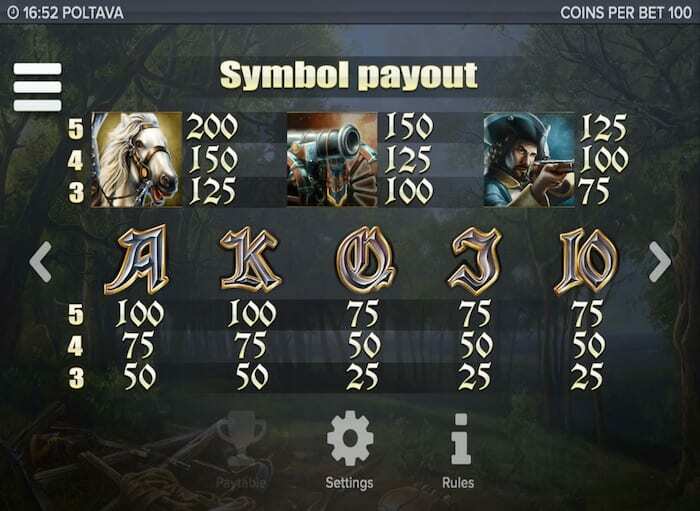 Poltava is a 40-payline slot game allowing you to win anything up to 180,000 coins while spinning the reels! If you're ecstatic to try this game, how about you take a look into our list of best video slot games? Poltava has a lot to offer not just the history buff but also those who enjoy entertaining online slots. In the words of ELK Studios with Poltava they “decided to build a volatile slot with dramatic scenery,” this is something very much achieved. Not only in creating a very good looking game board but also in creating a very volatile slot. 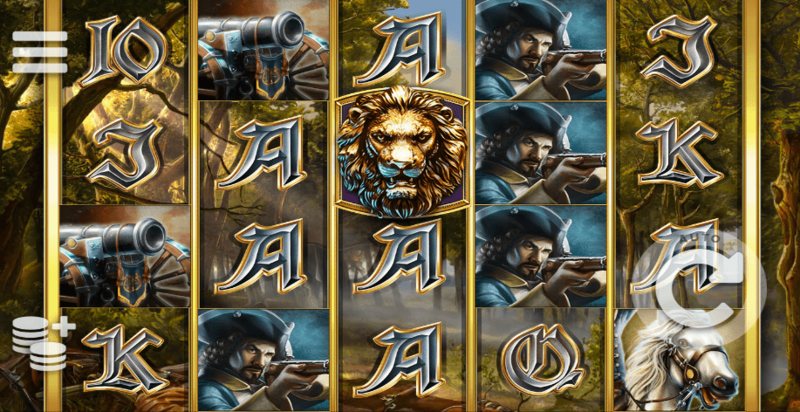 One of the main features in Poltava is known simply as the ‘Marching Reels Respin', where troops move from reel to reel, building up massive win-line combinations. The Marching Reels Respin triggers when one kind of battle army symbol covers a full reel. Players should also be on the lookout for the mighty Lion symbol. Three Lion symbols trigger the ‘Flames of War Free Spins', where extra lions are added as Wilds to create a wall of flames animation which takes control over the entire screen for a couple of seconds. Bets can be set to your own choosing, not only should players be looking to create walls of fire, but should also be looking at the other symbols that exist in the game. The Poltava Wild symbol substitutes all other symbols except for the lion symbols. As you’ve probably guessed by now, lions are what you want to be hitting to rack up high scores in hopes of getting a bigger payout. Hitting 3 of the Bonus Lion symbols will turn them into Sticky Wilds and trigger the ‘Flames of War’ bonus game with 3 free spins!